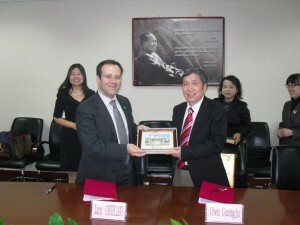 On October 20, 2013, Dr. Luca Castellani, Head of United Nations Commission on International Trade Law (UNCITRAL) Regional Center for Asia Pacific (RCAP) and Prof. Guangju Chen, Vice President of Beijing Normal University (BNU) signed the Agreement to establish the Joint Certificate Program on International E-Commerce Law (JCP). 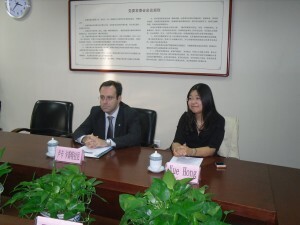 Under the Agreement, both Parties are committed to jointly develop the JCP that is a complex of teaching, research and international cooperation on international e-commerce law. Dr. Castellani stated at the Signing Ceremony that the JCP would be the world first international program that is specialized on international e-commerce law. He expected the JCP would become a world center in this field of law in the rapid growing e-commerce environment. 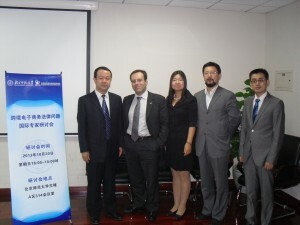 Prof. Chen stated that BNU was fully in support of the JCP and confident in its success. After the Signing Ceremony, Dr. Castellani joined the Research Seminar organized by BNU Institute for Internet Policy & Law on “Legal Issues in Cross-Border E-Commerce” and gave a keynote speech on the UN Convention on the Use of Electronic Communication for International Contracts (UNECC). The Officials from the Ministry of Commerce (MoC) Department of E-Commerce and other legal experts joined the Seminar and had productive dialogue with Dr. Castellani. All agreed that the legal experience acquired from UNECC and MoC (pending) Administrative Measures on Transnational Rules of Third Party Platform in Internet Retailing formed the basis for further legal development, particularly for international trade via e-commerce.